Educate Together believes in setting hight standards of accountability to our supporters and partners, our member schools and the general public. Every year, Educate Together publishes audited accounts, an annual report and a list of all decisions made at the latest General Meeting of Educate Together online. As a registered charity, the national office receives a core grant from the State which covers less than 20% of our operating costs, so we must generate funds from other sources to continue to do the work that we do. The maximum salary in the Educate Together national office is the CEO’s, and there are no bonuses paid. No Educate Together Director receives any remuneration whatsoever from the company. Educate Together has only one fully State-funded position, a seconded post from the Department of Education. 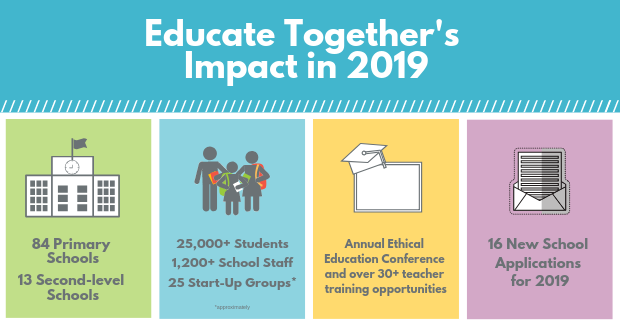 The Educate Together Board of Directors, on behalf of the member schools of the company, is deeply grateful to its staff who perform to the highest standards and commitment. Educate Together is fully committed to the highest levels of transparency in all its work. The Board of Directors of Educate Together have signed up to the Statement of Guiding Principles for Fundraising – a voluntary statement on best practice in fundraising which is available to download below.